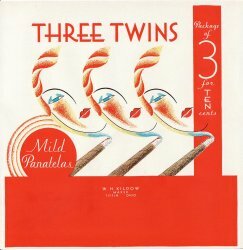 Three Twins Cigar Box Label, 1920s. Original vintage 8 3/4" square inner cigar box label from around the 1920s. Fantastic art deco stone litho image of three ladies heads rising from the smoke of three cigars.